You will have the opportunity to get up close and personal with these legends. 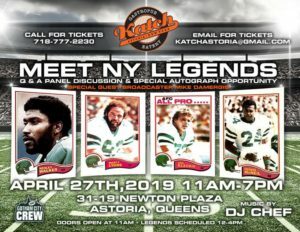 Treat the jets fan in your life to a once in a lifetime opportunity to get around these football heroes! 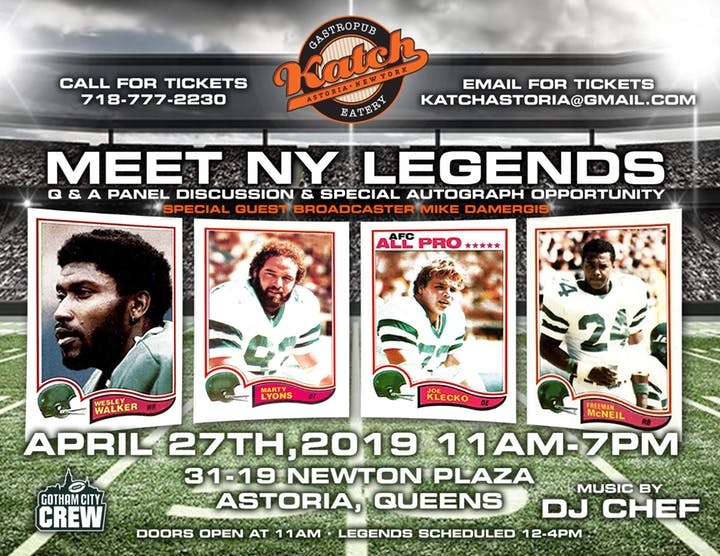 We’ll be chatting about the draft, have Panel discussions, and special autograph signings – Doors open at 11 and we highly recommend showing up early as this will be a SOLD OUT EVENT. None other than Celebrity “DJ CHEF” will be performing live! “The Chef That Rocks!” is the only entertainer who simultaneously cooks & DJ’s! Also the Food Network Cutthroat Kitchen Champion. ABOUT KATCH: Katch Astoria is a family-owned and -run business where there is always something fun to do! Located in the heart of Astoria, Katch is a unique multitasker that incorporates a visually stunning 2,000 square foot space that includes a 40 foot first class bar with 50 taps, a cushy banquette space, high top tables, a transitional dining space, over 70 HD TV’s and a 2,500 square foot beer garden culminating in the ultimate drinking and dining experience. Offering weekly food and drink specials, trivia nights, weekend bottomless brunch, themed event parties, happy hour specials and live performances of local artists and entertainers there’s always something going on at Katch.